Amos was born in Southwark on 20th September 1863 and attended Charterhouse School, before progressing to Clare College, Cambridge. Whilst at Cambridge he gained three blues appearing in the varsity football matches from 1883/84 to 1885/86, finishing on the winning side on each occasion. 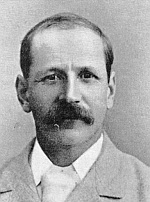 Amos won two England caps appearing against Scotland in 1885 and Wales in 1886 and also appeared for Old Carthusians, Hitchin Town, Hertfordshire and Casuals and he helped them to jointly hold the London Senior Cup in 1887. Amos played in the half-back position and was known for his heading ability, which was rare in the 1880's and was also noted for feeding the attack. Amos was ordained in 1887 and ministered in south east London from 1889 until 1922 when he became Rector of Rotherhithe. He was also a councillor on the Bermondsey Borough Council, and later elected an alderman. Amos died in Guy's Hospital on 2nd October 1931. C.T. Ashton was one of the greatest club men of the Corinthian F.C. and was third in the all time appearances and goals listings. Ashton was born in Calcutta, India on 19th February 1901, one of six brothers, two of which also went on to play for Corinth. Ashton showed his sporting prowess from an early age and whilst at Winchester College, he captain of the football, cricket, rackets and fives teams. Ashton progressed to Trinity College, Cambridge where he represented the University at football, hockey and cricket gaining blues in all three sports. Ashton continued his sporting success with the Corinthian F.C. and appeared in every F.A. Cup game up to and including the 1934/35 season, scoring two goals against Walsall and once against Newcastle United in the 1926/27 campaign and a hat trick against Norwich City in 1928/29. His goal scoring total of 145 goals in 208 games is even more impressive when you consider over 30 games in defence and he played in practically every position on the field for the club. It was as centre forward that Ashton made most of his appearances, but it was commonly thought that his best position was wing-half. Ashton was outstanding at dribbling, tackling and marksmanship, his only real weakness was in heading. 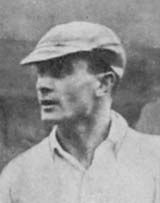 Ashton was capped by England in 1925 against Ireland and was also a regular in the England amateur eleven gaining 13 caps between 1922 on 1931. Ashton also appeared for Old Wykehamists in the Arthur Dunn Cup and the amateurs in the 1924 F.A. Charity Shield; later serving as vice president of the A.F.A. In the Summer months, Ashton continued to play cricket and played 89 matches for Essex County Cricket Club and on retiring from football assisted Beckenham Hockey Club and even played in England trials at that sport. Ashton was by profession a charted accountant and worked for Price, Waterhouse and Co., before becoming a member of the London Stock Exchange. In 1938, he joined the Balloon Barrage and in 1941 transferred to operational duties, becoming a pilot with the RAF. Ashton died on active service on 31st October 1942. Harold Godfrey Bache had a truly wonderful scoring record and was on a goals per game ratio, the most prolific scorer the Corinthian F.C. had in its history. He was born on 20th August 1889 at Churchill in Worcestershire and went on to be educated King Edward VI School in Birmingham and then Caius College, Cambridge. Whilst at Cambridge he gained blues at football, cricket and lawn tennis and even won the University Lawn Tennis Championship in 1911. Unfortunately for Bache he was at the height of his powers during "The Split" years and so he was never capped by the full England team; he did however obtain an A.F.A. international cap against Wales. Bache also played for West Bromich Albion and continued his cricket playing for Worcestershire who he made 20 appearances for. On the outbreak of World War One, Bache enlisted in the Lancashire Regiment, where he obtained his commission to the Lancashire Fusiliers in October 1914 becoming a Lieutenant. Bache still appeared in two further charity games for the Corinthian F.C. against Aldershot Command, scoring four goals. He was later posted to France and then Belgium where he was killed on 15th February 1916 at Comines Canal Bank, Ypres aged just 26 years. Norman Coles Bailey was born in Streatham on 23rd July 1857 and attended Westminster School, who he represented at football and cricket. 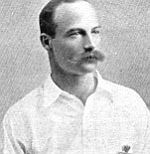 Bailey enjoyed a distinguished football career and was capped 19 times for England between 1878 and 1887 and this included ten consecutive caps against Scotland, seven of which were as captain. Amongst his many achievements, he helped Clapham Rovers to win the 1880 F.A. Cup final and was runner up with the same club a year earlier and also appeared for Old Westminsters, Swifts, Casuals, Wanderers, London and Surrey. Bailey went onto serve on the F.A. Committee from 1882-1884 and was Vice President from 1887-1890. Bailey was the first amateur to player to use his head on an equal footing with the professionals, and was one of greatest centre-halves of the early days, using his strength and pace to good effect. As a cricketer he was also quite useful and played for Streatham Cricket Club for many years. In 1880 he was admitted as a solicitor and he practised in London with the firm, Baileys, Shaw and Gillett. He died on 13th January 1923 at Cowley in Middlesex following an illness which lasted only a few days. Edward Charles Bambridge was a founder member of the club and was described as the greatest outside-left of his day, fast with excellent ball control. He was born in Windsor on 30th July 1858 and learned the game at St. Mark's School, before moving on to Malvern College. Charlie Bam as he was known went onto gain 18 caps for England. Bambridge also helped found the Swifts and also appeared for Casuals, Windsor Home Park, Streatham, Upton Park and Clapham Rovers. "Bam" as he was always known, had hosts of friends and no one could be his enemy, except on the football field, where he took all the hard knocks with the best of spirits. He once had a leg broken, and it was not thought that he could possibly be fit in time to play in a final tie for a local cup. His team was despondent; their rivals more optimistic. Without Bambridge against them they were sure to win. Just before the time for kick-off Bambridge, to everyone's surprise, drove up in a dog-cart ready dressed for the match wearing one large shin guard outside his stocking. Towards the end of a great struggle Bambridge finished one of his characteristic runs by shooting the winning goal. His colleagues, looking at the shin-guard, which showed signs of many kicks, asked how his broken leg stood the strain. Bam in his dry manner, replied: "Quite well, I wore the guard on the sound one." Bam appeared in the first North v South match at the Oval in 1880 and also featured for London in their series of matches against Sheffield. He served on the F.A. Committee from 1883-1886 and was later honorary secretary of the Corinthian F.C. between 1923 and 1932, where he was assisted in the task by his son. Professionally, Bam worked in the insurance business with Lloyd's. Jackson paid the following compliment to Bam: "Bambridge never lost his temper, and always smilingly took, or gave, genuine hard charges. I have never seen a wing player with better control of the ball or going so straight, while his ability to centre hard and fast all along the ground was extraordinary. Victory or defeat never varied his good humour, and he was always the life and soul of our touring parties when he joined them." Bam died in London on 8th November 1935. 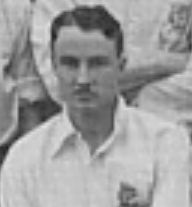 Alan Theodore Barber was one Corinth's sporting all rounder's and combined his footballing exploits with playing for Yorkshire County Cricket Club. He was born in Ecclesall, Sheffield on 17th June 1905 and educated at Shrewsbury School and Queen's College, Oxford where he captained both the football and cricket elevens, and he was also a Half Blue in golf. 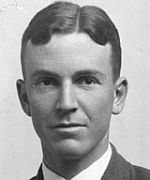 Barber graduated in 1929 and for one season in 1930 was captain of Yorkshire. The same year he became an assistant master at Ludgrove and he was promoted in 1937 to being headmaster, a position he held until retirement in 1973. Barber's biggest match for Corinth was the 1933 F.A. Cup tie with West Ham United, whilst he also played for Old Salopians and making the occasional appearance for Casuals. He died at Ludgrove on 10th March 1985. Richard Raine Barker was born in Kensington on 29th May 1869 and was educated at Repton School, who he represented at football. 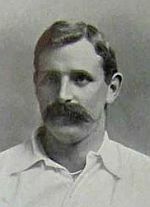 Barker played for Corinth for a number of years and gained his only cap for England in 1895 against Wales, one of eleven Corinthians who featured in this international. He also played for Casuals, who he helped to reach the final of the inaugural F.A. Amateur Cup final, before losing to Middlesbrough. Barker played in the wing-half position on both the left and right flanks. His strengths being his passing and kicking, but he lacked pace and it was said he was too slow to be an international. Barker was an engineer by profession and at one time he was manager of the Bromley Electric Light Company. He died on 1st October 1940. 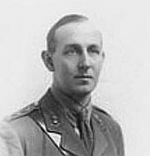 Alfred George Bower was the most capped Corinthian between the wars. He was born in Bromley on 10th November 1895 and was educated at Charterhouse School , where he remarkably failed to get his football colours. After serving in World War One he played for Corinthian F.C., Casuals, Chelsea where he made nine appearances in the Football League and Old Carthusians and was the last current Corinthian to gain an England cap, achieving five between 1923 and 1927 featuring twice against Belgium and Wales and once against Ireland. He also gained 13 amateur international caps between 1921 and 1928. From 1928 to 1933, Bower served on the F.A. Committee. Bower played at both left and right back and was one of the most prominent amateurs of the 1920's. He was an exceptionally good tackler and strong in the air. Bower was a calm head and could be inspirational to his colleagues, but his game could be affected badly if he was having problems as captain. Bower served in the Army and worked on the Stock Exchange from 1919 to 1954, before becoming a welfare officer to a Croydon firm until 1960. He died on 30th June 1970. George Brann, a distinguished all round athlete was born in Eastbourne on 23rd April 1865 and attended Ardingly College, at a time when the college team, consisting of masters and boys could take on any team in Sussex at both football and cricket. Brann went onto play for Swifts and Slough F.C. as well England whom he made three appearances for between 1886 and 1891. He was a wing forward difficult to stop because of his weight and pace, which he used to transfer himself and the ball from one end of the field to the other by the most direct route regardless of anybody who should get in his way. His cricket career saw him play for Sussex for 20 years and in a very strong side only featured at third in the batting in 1901, despite having an average of 74. He also went on various cricket tours to Australia, South Africa and North America. Brann scored 11,150 runs and holds the record eighth wicket partnership for Sussex with C.L.A. Smith set in 1902. After an attack of neuritis partially crippled his right hand, he took up golf and won along with E.G. Rand upset the odds at Walton Heath in 1910, where they won the London Amateur Foursomes Trophy. He was also secretary of Home Park Golf Club in Surbiton. Brann taught at Ardingly between 1885 and 1887 and died at Surbiton on 14th June 1954. Cuthert James Burnup was born in Blackheath on 21st November 1875 and was educated at Malvern College where he was captain of cricket and racquets and Cambridge University, where he achieved Blues in both football (1895-1898) and cricket. Burnup played football for Old Malvernians and Casuals who helped to win the London Charity Cup in 1897. In 1896 he gained his only England cap against Scotland. Burnup played in the outside-left position and although he should individual touches, these were never to the detriment of his team, and he was a passionate team player. ; he was a good dribbler of the ball and had pace. It was as a cricketer that Burnup really excelled and he was one of the great names in Kent cricket in the early 1900's. He was a fine opening batsman and consistently scored runs though out his career, finishing with a total of 13,585 runs from a career from 1895 to 1907. His many achievements include scoring the first ever double century for Kent, a score of exactly 200 at Old Trafford in 1900, scoring 26 centuries, not to mention being invited to tour Holland, America, New Zealand and Australia. In 1903 he was the Kent captain. Burnup worked in London as a stockbroker and then later in commerce. He died on 5th April 1960 in Golders Green. William Nevill Cobbold, otherwise known as 'The Prince of Dribblers' or 'Nuts' was born in Long Melford, Suffolk on 4th February 1863. Cobbold was educated at Charterhouse and then progressed to Cambridge University and won four Blues between 1883 and 1886. Whilst at University he also represented Cambridge at tennis and was useful cricketer, later making one appearance for Kent. 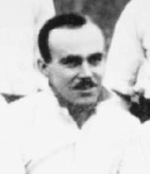 In all Cobbold was selected nine times to represent England scoring seven goals. Cobbold was extremely fast and was hard to stop, but despite being a brilliant individual player, he was part of the revolution in the game which led to great team play and combined tactics. "Built on ideal football lines, with sturdy legs and hips that could have carried a far heavier body than his, he was the finest dribbler ever seen. He played inside-left, and, swathed in rubber bandages and ankle-guards, he was careful to avoid getting hurt. He had a perculiar shuffling run, and a wonderful knack of shooting at quite unexpected moments and from quite unexpected angles. His shots were extremely accurate rather than particularly hard. His weakness was that he never headed the ball." Cobbold went onto become a successful Army tutor and was one of the best known coaches in the country. In later years he suffered from bad health, but still remained full of life and energy and kept up a keen interest in the careers of all his former pupils who he taught at West Wratting. Cobbold died on 8th April 1922. Bertie Oswald Corbett was born in Thame on 15th May 1875 and is still famed within the club for writing the first history of the club 'The Annals of the Corinthian F.C.' in 1906. Corbett was educated at Thame Grammar School and progressed to Oxford University where he gained Blues in football. Corbett was elected a member of the Corinthian F.C. and remained in continuous membership of Corinthians, Casuals and later the Corinthian-Casuals until he died on 30th November 1967. He was also secretary of the Corinthian F.C. between 1902 and 1904. Corbett also played for Reading and Slough during the 1906/07 season whilst teaching in the area, aswell as being capped once by England in 1901 against Wales. At the age of 15 he represented Oxfordshire; he played through out his career in the outside-left position and was noted for his pace and body swerve. G.O. Smith thought the most satisfying goal of his whole career which was scored in the 2-1 victory against Aston Villa in the Sheriff of London Shield, came about from a pass by Corbett. One of his many achievements came in 1903 when he helped to settle the controversy surrounding the use of penalty kicks in public schools matches. His other sporting achievements included playing cricket for Buckinghamshire and once for Derbyshire. Corbett was a teacher by professiona and started at Brighton College, before moving to Ludgrove. Later he ran his own prep school at Shardlow Hall in Derbyshire until he retired to Waddon Manor in Dorset where he had over 700 acres of land on which to start his new career as a farmer. During the war he handed over half his land to the nation. 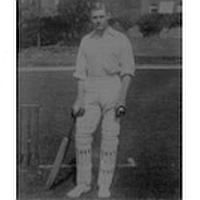 George Huth Cotterill was born in Brighton on 4th April 1868 and attended Brighton College whom he played for between 1882 and 1886, the latter two years as captain. Cotterill progressed to Cambridge University gaining Blues on four occasions between 1888 and 1891. His other clubs included Old Brightonians, Burgess Hill, Weybridge and he also played representative matches for Surrey and Sussex. Cotterill was a good sporting all rounder and as a cricketer, he played for Cambridge without getting a Blue and Sussex between 1886 and 1890, whilst also playing Rugby for Blackheath and Surrey. His other sports included athletics in both track and field and rowing. At football, Cotterill was a prolific goal scorer and averaged almost a goal a game, playing in the centre-forward position. He had a powerful build, pace and was gifted at dribbling and shooting. Cotterill died on 1st October 1950 in Llandaff, Glamorgan. Norman Creek was born in Darlington on 12th January 1898 and attended Darlington Grammar School where he captained the football team. He progressed to Cambridge University where he won Blues in 1920 and 1922, after being injured in 1921. By this time he had started playing semi regularly for Corinth, but it was after he graduated he became a fixture in their side and he exploded onto the scene with 21 goals in just 12 games during the 1922/23 season. He would go onto average more than a goal a game and to feature in the majority of the Corinthian F.C. 's F.A. Cup ties until the 1934/35 season. In 1922 he signed amateur forms with Darlington and made two Football League appearances between 1922 and 1924. In 1923 Creek gained his only England cap, scoring in a 4-1 victory over France. He did however gain five amateur international caps between 1922 and 1932. Creek bowed out in style for the Corinthian F.C. and in his last game in 1936 against Wiltshire scored four goals. Creek had the honour of scoring the Corinthian F.C. 's first F.A. Cup goal against Brighton in the 1922/23 season. Creek served in the Army during World War One earning himself the M.C., this was later complimented by and M.B.E., but he essentially devoted his life to football and after leaving the teaching profession, worked for the Football Association from 1954 to 1963 and managed the England amateur international side and the Olympic Games team. Following this Creek became a Daily Telegraph football writer for nearly 20 years and wrote the second history of the club 'A History of the Corinthian F.C.' published in 1932. Creek died at his Folkestone home on 16th July 1980 and his obituary stated; 'He departed as he had lived peacefully for he was the kindly gentle soul with a ready laugh who always sought the best in people and things'. 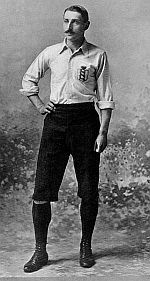 Samuel Hulme Day is one of a select band of Corinthians who scored over one hundred goals, although this has almost been forgotten, probably due to 68 of them being scored on tour. Sammy Day, as he was known was born on 29th December 1878 in Peckham Rye and attended Malvern College, it was during his time there that he appeared for Kent at cricket and scored a century in his first county match. Day then moved to Cambridge and gained a cricket Blue as a freshman in 1899, later captaining the University in 1901. Day appeared just once for the football eleven, but went onto develop into a one of the best inside-forwards, playing for Corinth, in the 10-3 demolition of Bury in the Sheriff of London Shield. Day was capped three times by England at full international level in 1906 and once at amateur level. Due to 'The Split', Day made a further five appearances in A.F.A. internationals. Day's other club was Old Malvernians. During the 1906 tour to Canada and the United States, Day scored a hat trick of hat tricks against All New York and scored another impressive total of seven against Cincinnati. In his cricket career Day scored 5,893 runs for Kent between 1897 and 1919. Day was headmaster of Heatherdown preparatory school for many years, and prior to this was assistant master at Westminster School. Day died at his home in Chobham, Surrey on 21st February 1950. Alexander Graham Doggart was the leading all time Corinthian goal scorer netting 207 goals. He was born in Bishop Auckland on 2nd June 1897 and attended Darlington Grammar School, later attending Bishop Stortford School whom he played for between 1912 and 1916 and later became a governor of. His education was broken by World War One, but on being demobilized in January 1919 he went to King's College, Cambridge. Whilst at Cambridge, Doggart gained degrees for Engineering and Economics and won Blues for football in 1920 and 1921, having stood down in favour of his friend F.N.S. Creek in 1919 because of injury, Doggart went onto study as a chartered accountant, qualifying in 1927. Doggart was a regular for Corinthians between 1920 and 1932, but still found time to play for Darling where he made two Football League appearances, Bishop Auckland in 1923 and Casuals from 1924 onwards. Doggart scored a hat trick on his Corinth debut against Charterhouse in 1919 and proceeded to score regulary, his most famous goal coming in the 1-0 victory over Blackburn Rovers in the 1923/24 F.A. Cup. 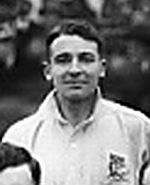 He gained his only full international cap for England in 1923 in a 2-2 draw with Belgium, whilst gaining four amateur international caps between 1921 and 1929. From 1932, Doggart was a F.A. Councillor and in 1951 he became vice president and an England selector from 1954. In 1961 he became chairman, having already been president of the Corinthian-Casuals and Selsey football clubs for may years. He was also heavily involved in cricket having gained cricket Blues whilst at Cambridge and also playing for Durham and Middlesex and served on the Sussex County Cricket Club committee from 1949, as well as the M.C.C. finance committee from 1955, the year he became a full member. Doggart also served in the Royal Observer Corps (Selsey) and was honorary secretary for seven years of the Selsey branch of the R.N.L.I., whilst being a justice of the peace for West Sussex. His obituary stated; "In spite of shy, quiet ways and soft speech he was a determined leader of the whole (F.A.) Council, a body who by circumstance usually have many conflicting interests. There was no such conflict within Doggart. A member of no League organisation, he was an F.A. man pure and simple, through and through. "Due to his independence Doggart made fresh changes at the F.A. which included the appointment of Alf Ramsey as England manager. Doggart died suddenly, collapsing at the Football Association's A.G.M. on 7th June 1963. Johnny Douglas was certainly one of the more colourful Corinthian F.A. members, although he did not play that regularly. Douglas was born in Clapton on 3rd September 1882 and attended Felstead School, before joining his fathers timber merchants firm John H. Douglas and Co. In 1901, Douglas entered first class cricket with Essex and after a baptism of fire, he survived to slowly become a fine player. In 1911 Douglas became captain of Essex and this elevated his play to the next level and he was selected to tour Australia with the M.C.C. that same year. He later visited South Africa and Australia again in 1920/21. Between 1901 and 1928, Douglas scored 24,531 runs for Essex including 26 hundreds, whilst taking 1,893 wickets. As a result of this he was selected for 23 Tests and he led England to an Ashes triumph in 1911-12. His first real achievement came in the sport of boxing where by 1905 he had become the best middleweight in England winning the amateur championship and this was followed in 1908, when Douglas became Olympic champion, in what all good judges said 'was one of the most brilliant exhibitions of skilful boxing allied to tremendous hitting ever seen.' Douglas played a number of games for Corinth, and also the Casuals where he gained an A.F.A. international cap during "The Split" years. Douglas died in true heroic circumstances trying to rescue his fathers life after the boat in which they were travelling, "The Oberon", collided in fog on 19th December 1930, seven miles south of Laeso. The boat took just three minutes to sink and only four passengers survived. Arthur Tempest Blakiston Dunn is still one of the most famous names in amateur football as following his premature death, his friends started a competition in his memory which is still go strong today. Dunn was born in Whitby on 12th August 1860 and went to Eton College, before progressing to Cambridge University where he gained blues in 1883 and 1884. During this period he featured for the Old Etonians and won an F.A. Cup winners medal in 1882 and was runner up in 1883. 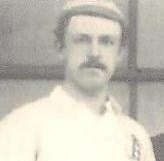 Dunn also won four England caps between 1883 and 1892 and also represented Cambridgeshire and Norfolk. Not surprisingly he had limited time to appear for Corinth but still amassed a reasonable total. Dunn was a teacher by profession and in 1892 founded Ludgrove School at New Barnet, which later employed G.O. Smith and W.J. Oakley as joint headmasters. His name goes on in the form of the Arthur Dunn Cup, which was donated by fellow Corinthian R.C. Gosling. His daughter, Mary Dunn who was born in 1900 went onto become a satirical writer of some note. He died just days after refereeing an Oxford University match on 20th February 1902. F.H. Ewer was a great club man and made 160 appearances which was the tenth most in the history of the club. He was born in West Ham on 30th September 1898 and joined the Corinthians and the Casuals in 1922. He played 105 games for the Casuals and it was whilst them that he was awarded his two England full international caps in 1924 against Belgium and France. He also gained 14 amateur international caps between 1924 and 1930. Ewer also featured for the amateurs in the 1924 F.A. Charity Shield. Ewer played in the wing-half position and could play on either side of the field; he was amongst the leading amateurs of the era and was a resolute, gritty performer, who came back from many injuries and never knew when he was beaten. He later became joint secretary of the Corinthian F.C. in the 1937/38 season. Ewer was a member of the Stock Exchange. He died on 29th January 1971. Howard Fabian was another tremendous club servant and featured for Corinthians, Casuals and Corinthian-Casuals during his career. Fabian was born on 20th March 1909 in East Finchley; he was educated at Highgate School and went onto Cambridge where he gained a Blue for football. Fabian joined the Casuals in 1928 and went onto appear 118 times for them, scoring 41 goals; he featured in the first Corinthian-Casuals match following the amalgamation against Oxford City, and came out on the other side of World War Two and made a further eight appearances for them. Fabian's greatest honour was achieved whilst with the Casual's when he helped them win the 1936 F.A. Amateur Cup final against Ilford. Fabian also played for Old Cholmeleians and made a number of appearances in the Football League for Derby County. Another of the leading amateurs of the 1930's he gained six amateur caps for England. Fabian worked as a master at Repton School and died on 26th September 1984 at Cranbrook, Kent. 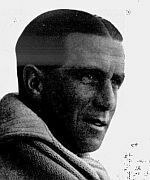 Charles Burgess Fry was one of the finest all-round athletes of his generation. Fry was strong, well built and full of the enthusiasm and vigour of youth which helped enable him to excel at sports. He was born in Croydon on 25th April 1872 and spent his child hood growing up in Kent. In 1885 Fry went to Repton School, before progressing to Wadham College, Oxford. At both institutions he gained distinction in both work and play gaining a first at Oxford in Classical Moderations, but due to other factors, only a fourth in Greats. Whilst at Repton he was captain of both the cricket and football elevens as well as twice winning the aggregate prize for athletic sports. His sporting career at Oxford was even more impressive and he was a triple Blue, captaining both the cricket and football elevens, whilst being president of the athletic club in his third year. In 1892 during the inter-university sports, he set a record for the long jump of 23ft. 5in. which stood for 21 years. Two years later he scored 100, not out, against Cambridge and at football gained an international cap for England against Ireland in 1901. Fry would have secured a fourth Blue, for Rugby, had he not suffered an injury several days prior to the university match, but still appeared for Blackheath, the Barbarians and Surrey. His football career saw him play for West Kent, when only 12 years old, Repton School, Casuals, Old Reptonians, Southampton and Portsmouth. In 1902 he played for Southampton in the F.A. Cup final when they lost in a replay to Sheffield United. 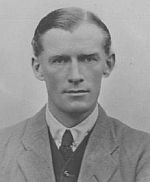 Fry developed into a cricket great after he left Oxford, where although he was difficult to get out, but his style was stiff and low scoring. He started playing for Surrey on leaving Oxford, but moved on to Sussex where in the Summer of 1898, blossomed into an international class player. It was at this point that his freedom of strokes and the power of his driving took on a new dimension. And between 1898 and 1905, Fry was twice first in the English batting averages and four times second. In one year he totalled over 3,000 runs, whilst in five others scored over 2,000. 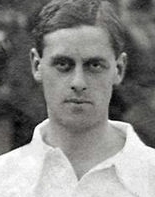 Although Fry struggled at international level at first he finally established himself in 1905 scoring 144 at the Oval against Australia. An injury laid him low during the 1906 season, but he recovered and transferred from Sussex to Hampshire under a residential qualification and captained England against Australia and South Africa in 1912. At the age of 50, Fry retired from first class cricket in 1921, having made 94 centuries and holding the record for consecutive centuries, having scored six consecutively during the 1901 season. Fry's life outside the sporting world, saw him make several unsuccessful attempts to enter the House of Commons standing as a Liberal, whilst also writing several books and editing a magazine entitled Fry's Magazine. Fry ran the Mercury from 1908 to 1950 which was a training ship for the Royal Navy and helped produce many naval officers. He was also a stimulating speaker, with a wide range of interests including public affairs and the intellectual pursuits he loved at his school and university. Interestingly he had been invited to take the throne of Albania and Hitler asked his advice when setting up the Hitler Youth and tried to persuade von Ribbentrop that Nazi Germany should take up cricket. Fry was also part of the Indian delegation at the League of Nations. Fry suffered a break down in the late 1920's and for the rest of his life dressed in strange unconventional clothes and was certainly eccentric, whilst he even became scared of Indians. When he was in his 50's he considered trying to become a Hollywood star! Late in his life, Fry was asked during a television interview, what, in his opinion, was his greatest achievement. After considering his answer he replied 'Having a poem published in The Times: so few men, apart from Poets Laureate, have achived that.' Fry passed away on 7th September 1956. Robert Cunliffe Gosling, was born in Farnham, Essex on 15th June 1868 and was educated Eton, where he like his five younger brothers excelled at football and cricket. Gosling progressed to Cambridge, where he went to Trinity and gained a Blues at football in 1890 and at cricket. Gosling also appeared for Old Etonians at football and for Essex, Eton Ramblers and I Zingari at cricket, the latter of which was his initiative. Gosling gained five England caps, one as captain, never finishing on the losing side and scoring two goals in the progress. Gosling played as an inside-forward and was fast with a good shot and unselfish. Sir Frederick Wall, the secretary of the F.A. once described him as 'the richest man who ever played football for England. '; he was a country gentleman, succeeding his father and owned a large amount of land in Essex and Hertfordshire. He was one of the more popular squires to be found. After retiring from sport Gosling served as a Jusitice of the Peace in Essex and later became High Sheriff. He died in his bed on 18th April 1922 leaving a fortune worth £700,000 or around £21,000,000 at today's prices. Stanley Shute Harris was born in Clifton, Bristol on 19th July 1881 and attended Westminster School where he honed his football ability. Harris later progressed to Cambridge University where he gained Blues for three consecutive years 1902 to 1904, whilst being captain in last year. His playing career saw him also appear for Old Westminsters, Casuals, Worthing, Portsmouth and Surrey. 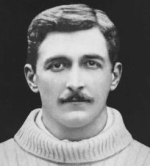 Harris playing at inside-left was described as a splendidly built amateur adroit at dribbling and shooting and this helped him to achieve six full international caps for England scoring two goals and also captaining the side; he was also capped once by the England amateur team. Harris was a useful cricketer who played for Cambridge University, although he failed to gain a Blue, but still went onto make several county championship appearances for Surrey, Gloucestershire and Sussex. Harris was headmaster of St. Ronan's School in West Worthing and was highly regarded by the pupils for his influence and guidance which shaped their lives and character, so much so that there was a committee established to raise funds for a memorial to him. Harris died on 4th May 1926. Frank Hartley was a Corinthian rarity in that he did not come to the club via the tradition Oxford or Cambridge University supply chain. Hartley was born on 20th July 1896 at Shipton-under-Wychwood and came to prominence whilst playing Oxford City in the Isthmian League. He made his Corinthian debut on New Year's Eve 1920 at Anfield and although only making occasional appearances for the next couple of years, became a regular from 1924 onwards. Hartley had already signed amateur forms with Tottenham Hotspur, by this stage and later in 1928 he did in fact turn professional with them at the age of 32, making seven appearances for them over the next three years. Hartley was capped at full international level by England in 1923 against France. He also was capped seven times at amateur level between 1923 and 1926. His other sporting career saw him represent the Minor Counties at cricket and had a trial for England at Hockey. Hartley was a member of an Oxfordshire farming family. He died on 20th October 1965. 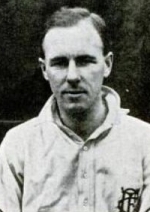 Kenneth Edward Hegan's 167 appearances was the eighth highest of any Corinthian. Playing during the clubs F.A. Cup glory years, he was an outstanding outside right and outside left. He was born in Coventry on 24th January 1901 attended Bablake School, before moving on to the Royal Military College at Sandhurst. Hegan later served with the Dublin Fusiliers and the R.A.S.C. and also represented the Army at football. In 1924, despite his slight build and dimultive height of five foot seven and a half inches, he was said to have been the fastest player around and certainly was one of the main suppliers of goals for the likes of Doggart, Creek and C.T. Ashton. He was capped four times in 1923 by the full England team scoring four goals, two each against Belgium and France. Hegan was also capped 23 times by the England amateur team. One of the greatest Corinthian players of all time, he once played for nearly ninety minutes with a broken tibia against Millwall in the F.A. Cup. He was always full of humour and regularly imitated the 'Old Corinthian' complete with pipe, bowler hat, long stockings and tankard of beer. Hegan retired from the Army in 1949 as a Lieutenant-Colonel having been awarded an O.B.E. as a result of his service during World War Two. Arthur George Henfrey was born in Wellingborough in 1868 and attended Wellingborough Grammar School and Cambridge University. Henfrey gained Blues in 1890 and 1891, in the former appearance he was part of an International forward line which included R.C. Gosling, G.H. Cotterill, J.G. Veitch and M.H. Stanbrough and Cambridge duly defeated Oxford 3-1. He also appeared for Finedon F.C. and Northamptonshire. Between 1891 and 1896 Henfrey was capped five times by England, scoring two goals. 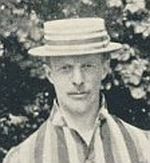 Henfrey also played cricket with distinction and played for Northamptonshire from 1886 to 1899, being captain in 1893 and 1894, although he did not gain a Blue for cricket whilst at university. He was a Conservative in politics and served on the County Council and several other local bodies. 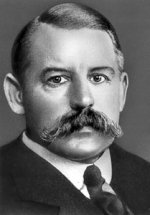 He died on 17th October 1929 aged 61. Described by Norman Creek in his Corinthian volume as: " probably the best centre half the club has ever had", he captained Corinthians in their famous 11 - 3 defeat of Manchester Utd in 1904. He led the side on the club's two visits to Brazil in 1910 and 1913 and on other foreign tours. He was also on the ill-fated boat to Argentina. A product of Shrewsbury School and Oxford he taught at Repton where he was also a Captain in the OTC. In the years before the 14-18 war he played a remarkable 170 times for Corinthians, scoring 24 goals; also 79 games for Casuals scoring 12 goals. He won 12 full international caps for Wales. As a player and committee man for both Corinthians and Casuals, and President of Casuals from 1922, this distinguished war hero was very much involved in bringing the two clubs together in the years leading up to 1939. When the details of the merger were finally agreed , the minutes of the first AGM for Corinthian-Casuals F.C.. on 22 May 1939, record: "Lieutenant Colonel M.M. Morgan-Owen will be President." He held that position until he died in 1950, age 77. E.D.R. Shearer was born in London in on 6th June 1909. The young Shearer attended Aldenham School, where he played outside right before returning to Ireland where he lived and worked throughout his sporting life. Back in Ireland, Shearer concentrated on cricket playing for the City of Derry, where he won the North West Cup, and the Bond Cup (1927-28) for the highest batting average. In the 1929 season, Shearer scored 2,000 runs and continued to play despite his footballing commitments for the City of Derry, the Gentleman of Ireland and the Northern Cricket Union of Ireland who he appeared for 33 times between 1932 and 1952. In 1938 Shearer scored 56 for the Gentleman of Ireland in their defeat to Australia, whilst in 1951 he became the first Irishman to score a century at Lord's against the M.C.C. In 1929, Shearer joined 'The Casuals F.C.' making his debut in October against Kingstonian. The following season saw Donald score 25 goals in 25 appearances for The Casuals and this attracted the attention of the Corinthian F.C. and he duly made his debut April scoring against Queen's Park at Lea Bridge, before playing again for Corinth, against Arsenal in the Sheriff of London Shield scoring again. 1931/32 started explosively for Shearer as he opened the season by scoring six goals in three games for The Casuals, before returning to Ireland and featured for Derry City scoring back to back hat tricks against Bangor and Glenavon. Donald returned to England to play on the Corinthian F.C. 's Christmas tour, before lining up in the F.A. Cup third round tie against Sheffield United. The following season Shearer made only fleeting appearances for the Corinthians the most important was in the jubilee Sheriff of London Shield match against Arsenal. During the 1933/34 and 1935/36 seasons, Shearer appeared in the important Casuals games in the F.A. Amateur Cup and in the latter season succeeded in helping Casuals lift the trophy for the only time in their history, scoring one goal in the final against Ilford. Due to this game, Shearer missed the Irish Cup final that Derry City appeared in. For Corinth, Shearer appeared until the 1938/39 season appearing in the cup ties against Watford, Reading, Ilford, and Southend United twice, whilst regulary featuring on tour in Ireland, Germany, Denmark and Switzerland. Derry City was his main club, however, and he scored 78 goals during this period for them and gained honours, in 1936/37 helping them to lift the City Cup and North West Senior Cup. In 1934 he also helped his old school to victory in the Arthur Dunn Cup final for the first time when Old Aldenhamians defeated Old Wykehamists 6-2. Shearer gained many representative honours being capped seven times for the England amateur team, and also appeared on many occasions for the Irish League the most notable occasions being a 3-0 win over the Scottish League in 1933 and a 2-1 victory over the Football League in 1935. He also represented Great Britain at the 1936 Olympics in Germany and appeared in the second round defeat to Poland where he scored one goal. Shearer collected many other representative honours and appeared for the Isthmian League and F.A. XI's through out his playing career and was offered a professional contract by Arsenal amongst others. Shearer retired from football in June 1939, and later after briefly being tempted out of retirement whilst in the army, he finally end his playing days by throwing his boots into the Nile! During the war, Shearer rose to the rank of Colonel, whilst serving with the Royal Artillery and was mentioned in despatches and awarded the O.B.E. He later was managing director of Lindsay Bros and went onto be a director of Sir Alfred McAlpine & Son Ltd, and a member of the Londonderry Development Commission. On his retirement, Shearer became the first chairman of the Northern Ireland Sports Council and was president of the Irish and Northern Cricket Unions. Donald continued to be associated with the Army and reformed and commanded the 429 Antrim Coast Regiment, Royal Artillery, TA and was head of the Territorials in Northern Ireland. In 1950 he was appointed an honorary ADC to the Governor of Northern Ireland and from 1960 to 1969, was also honorary ADC to the Queen. In 1974, he was awarded the C.B.E. for his services to Northern Ireland. Donald has been described as unassuming and gentlemanly and popular figure in Irish football, which is confirmed in the fact that he arranged with Derry City, that should he be selected ahead of a professional, then the professional would still be paid and receive a bonus if the team won. The meticulous records which he kept went a long way to helping Rob Cavallini's book, "Play Up Corinth", throw new light on the club.